A planning application for the regeneration of Aberdeen Market and the former BHS building in the city centre has been lodged. Proposals for the buildings at the east end of Union Street - from owners Patrizia - feature shops, cafes, restaurants and office space. Patrizia director Shaun Hose said the plans incorporated feedback from a public consultation. He predicted the proposals could "reinvigorate" the area. 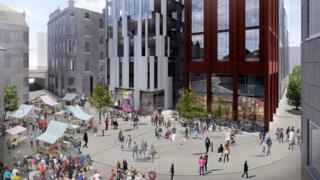 Russell Borthwick, chief executive of Aberdeen and Grampian Chamber of Commerce, said: "The indoor market is identified as a key project in the City Centre Masterplan. "Redevelopment of the area will be yet another significant step forward in the ongoing transformation and revitalisation of our city." He added: "Not only will it give a new lease of life to this part of the Merchant Quarter, the mix of retail and leisure will complement the existing offering in the area and help draw people back into the city centre." The application prompted a reaction on social media. On Twitter, Ewan Duthie suggested turning the indoor market into an international food market. He said: "With a bit of vision beyond more offices and chain restaurants it could be a fantastic attraction." And Chris L said: "Pretty much anything is better. Personally adding some more open space to The Green would be good."